Lucidchart is always searching for ways to improve our user experience. On that note, Lucidchart offers drop shadows, locking objects, and a find/replace tool to make diagramming easy and custom to your needs. With just one click, you can add depth and a professional quality to diagrams by enabling drop shadows. 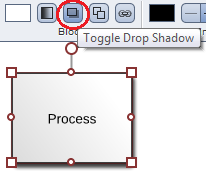 Simply select a shape and toggle the drop shadow option in the properties bar. When no objects on the page are selected, clicking on the same button in the properties bar will toggle drop shadows on/off as the default choice for all new shapes. 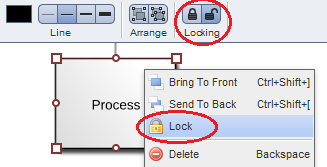 When diagramming or creating wireframes, you may find objects that you would like to lock in place, so they don’t accidentally move or change due to an inadvertent mouse click.. You can lock an object in two ways: either (1) right-click on the shape and select “Lock”; or (2) use the lock icon in the properties bar. Once the object is locked, no changes to the object (moving, resizing, styling, etc.) can be made. To unlock the object, select it and use the unlock icon in the properties bar. Ever had a large diagram and can’t remember where you put something? 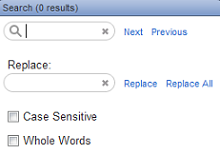 With the find tool, you can search to quickly locate the text that you are looking for. When you select ‘Search’ from the drop-down menu on your document, or use the Ctrl-F hotkey, a window will appear at the bottom of your document. Enter the text you are looking for to find and/or replace it throughout the document. Press Esc to close the dialog when finished. We hope you enjoy these features - log in to try them now. As always, let us know if you have any questions, feature suggestions or feedback.